I'm wearing a hairnet. And I'm posting the photo on the internet for the world to see. And I'm pretty okay with it. I have a wonderful giveaway for you today. But let me just tell you how it came about. The Cuban Heritage Day Committee (of which I am a proud member) had a meeting at the Gaviña Coffee Roasters plant. You know how much I love coffee and I love the Gaviñas, so of course I said YES! I've taken this tour a couple of times and I swear to you it never gets old. Plus the amazing fragrance of fresh coffee is everywhere and quite intoxicating. The freshest beans, the highest standards, the most delicious coffee - it's not accidental that Café La Llave® is one of the best espressos out there. And for us Cubans, good espresso is...everything! So we toured the beautiful plant. 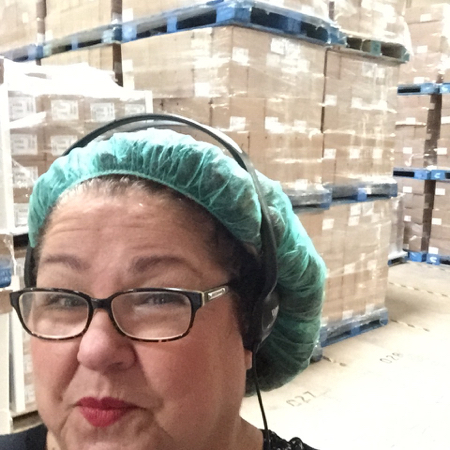 I'm not going to post photos of the rest of the committee in hairnets because I'd really, really like to keep my friends, thankyouverymuch. But here we are afterwards, in all our Cubanity, after having toured and having been fed. And having had our über-fresh cortaditos. I'm so grateful to our lovely host, Leonor Gaviña for her gracious hospitality. And to the Gaviña Coffee Roasters for their generosity in providing today's awesome coffee giveaway. Full disclosure: I was given a bag of Gaviña Coffee Goodies to enjoy and another to give away. I was not otherwise compensated to write this post. The opinions and text remain my own. Do you make it at home or do you go out in the world to find it? Please leave your comment on this post and I'll choose one winner on Monday, June 8th, 2015 at 11am PST. "You can't buy happiness, but you can buy coffee, and that's pretty close."